Black, shiny hair symbolizes good health and youth. If you are suffering from gray hair problem then you must stop it right away before it starts hampering your beauty. Chemical treatments can damage your hair rather than bring them benefits. Hence, here we bring you the best natural treatments to treat your gray hair problem to the fullest! You can experience gray hair because of numerous causes. Some of the common causes are listed below! The main reason for gray hair is hereditary. Excessive smoking and high intake of tobacco can result in gray hair. Psychological troubles or emotional stress also results in gray hair. If you lack vitamins, copper, iodine, and iron in the diet. People suffering from hypothyroidism, anemia, neurofibromatosis, and tuberous sclerosis can lead to gray hair. Indian curries or curry leaves have great benefits for hair. It contained Vitamin B that restores the functioning of natural pigmentation in hair follicles and effectively treats gray hair. Also, it supplies hair with beta-carotene and essential nutrients that aid in treating damaged hair roots, prevents hair fall, stimulate new hair growth and prevents graying of hair. You can mix curry leaves with coconut oil as it is an excellent natural conditioner for rough, dry hair. A mixture of coconut oil and curry leaves is great to make hair lustrous, bouncy and manageable. You can take 1 cup coconut oil and add a handful of curry leaves to it. Let the oil get one boil and then remove from flame. Allow the oil to cool down and then massage it well into your hair and scalp. Do this twice or thrice a week. Amla, also called as Indian gooseberry is an effective home remedy to treat gray hair. It is a rich source of vitamin C and has incredible anti-aging properties. Besides preventing gray hair, it boosts hair growth and enhances the hair health. Fenugreek, commonly known as methi is an excellent source of iron, potassium, Vitamin C, L-tryptophan, alkaloids, and lysine. These are great benefits for the skin and hair. A mixture of both prevents gray hair problem, combats hair fall, and boosts new hair growth. Grind the fenugreek seeds to a smooth powder. Heat the oil and add amla pieces to it. Let the mixture boil for few minutes. Add fenugreek to the oil and then remove the pan from flame. Apply the mixture once the oil has cooled down. Almonds are a powerful natural source of Vitamin E. Hence, it fights away fine lines, age spots, and wrinkles. Almond oil is great for hair as it deeply nourishes the roots, enhances elasticity and prevents the occurrence of split ends. Almond oil can impart a glow to hair and treat dandruff as well. Lemon juice is an excellent source of Vitamins C, B and Phosphorus. All these ingredients are great to prevent gray hair and promote hair nourishment. Mix 2 tablespoon of almond oil with 3 tablespoons of lemon juice. Apply it to your scalp and hair. Wash off with lukewarm water and mild shampoo after 30 minutes. You must be aware of benefits of black tea for prevention of cancer. But do you know that black tea is a powerful way to enhance cardiovascular health as well as enhance skin and hair health? Black tea is loaded with caffeine and antioxidants that stimulate hair growth and enhances hair elasticity and strength. Also, it adds a natural black shine to the hair. Just take 2 tablespoons of black tea and add 1 tablespoon of salt into it. Let the mixture boil for two minutes. After this remove it off from the flame. Let it cool for some time and the strain the liquid. Wash your hair well and let it dry consider it a final rinse. Do this for 2 to 3 times a week. Problems like thinning of hair and hair loss can be treated well with onion. It is because onion is rich in antioxidant catalase and avoids deposition of harmful hydrogen peroxide on hair roots. Hence, it is excellent to promote new hair growth and treat the gray hair problem. Even research shows that onion juice enhances the catalase levels and restores the natural color of hair strands. It adds natural shine to hair and prevents excessive oil production with the hair. All you need to do is mix 3 tablespoons of onion juice with 2 tablespoons of lemon juice in a bowl. Apply it to your scalp and roots for 30 minutes and then wash off with a mild shampoo. Repeat this 2 times a week. Sage and Rosemary have extensive uses with one major being highly beneficial for skin and hair. Rosemary is a powerful herb that works effectively against hair fall and checks new hair growth. It is excellent to treat hair pigmentation and hence prevents premature graying of hair. Sage is another natural ingredient great to fight cellulite problem in hair. You can add a handful of rosemary and sage leaves to two cups of water. Boil the mixture for 10 minutes and then set it aside for at least one hour. Grind the mixture and then apply it to your hair and scalp. Leave it for one hour. Wash well with a mild shampoo. Repeat this 2 times a week. A mixture of curry leaves and buttermilk is excellent to treat premature gray hair problem. Besides a rich source of probiotics, it is an excellent source of lactic acid. It enhances hair texture, makes them more manageable and prevents premature gray hair problem. 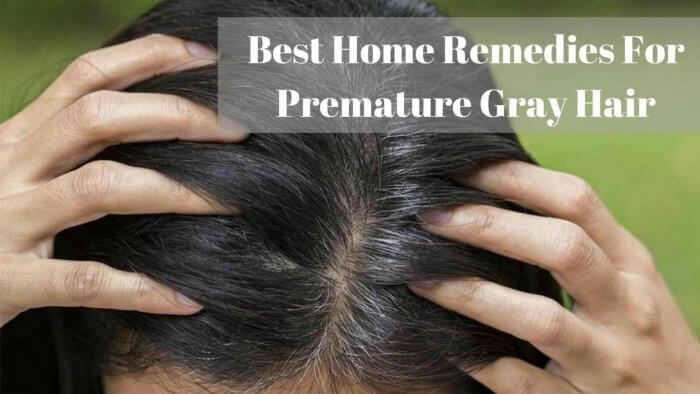 So, try these home remedies to pamper your hair and say goodbye to gray hair problem forever! NextHow to Hire the Right Android Developer?